Last week, I made a super-easy puréed squash soup with roasted red peppers and buttermilk. But that recipe barely made a dent in the hulking squash I'd roasted the weekend before, and I had buttermilk and roasted red peppers left over, too. So, here's another recipe using the same ingredients. It has a similar flavor profile to the soup but a totally different format. Together, I like to think of them as a diptych: Squash Two Ways. Besides, when was the last time you made blini? Never? Well, they're basically just adorable little pancakes — and perfect party finger snacks. These have a lot of squash in them, so they're almost creamy on the inside. And since everyone loves dipping bready things into cheesy things, you may as well chop some herbs and blend them into sour cream and serve that alongside. Combine the dry ingredients in a large bowl and whisk thoroughly. Heat three tablespoons of butter in a large skillet over medium heat. Add the roasted squash and mash until smooth. Place in a medium mixing bowl and allow to cool. Add the buttermilk, milk and eggs to the squash and blend until smooth. Hollow out a well in the dry ingredients and pour the squash mixture and Parmesan into the middle. Using a rubber spatula, combine with a few swift turns until everything is well blended. It should be about the consistency of pancake batter or just a little thicker. Heat a large skillet over medium-low flame. Toss a pat of butter into the pan and allow to brown. Using a teaspoon, drop one-and-a-half-inch dollops of batter into the pan. Place a piece of red pepper on top of each dollop and allow to cook 2-3 minutes, until the blini spread to about two inches in diameter and begin to set. Flip and cook for another 1-2 minutes until both sides are well browned. Repeat, adding more butter between batches, until you've used all the batter. 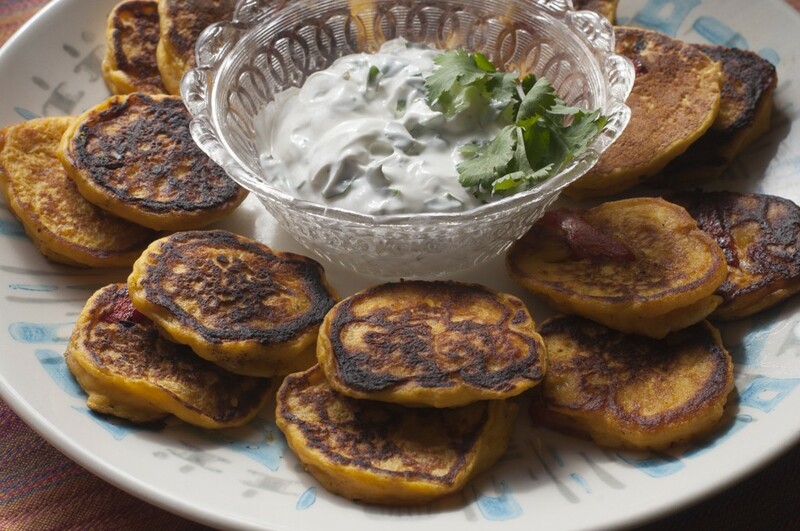 Mix the crème fraîche or sour cream with the chopped cilantro and serve on a plate with the blini. *Quarter a winter squash, remove seeds and roast in a 350 degree oven 60-90 minutes, until soft. Cover with foil and allow to cool; reserve any liquid in the roasting pan. When the squash is cool, scoop the flesh away from the skin, place in plastic quart containers, and refrigerate or freeze for later use. I like to mash it with butter and maple, but you could also use it in pasta, polenta, pudding or however else you see fit. Don't Toss That Stale Baguette!